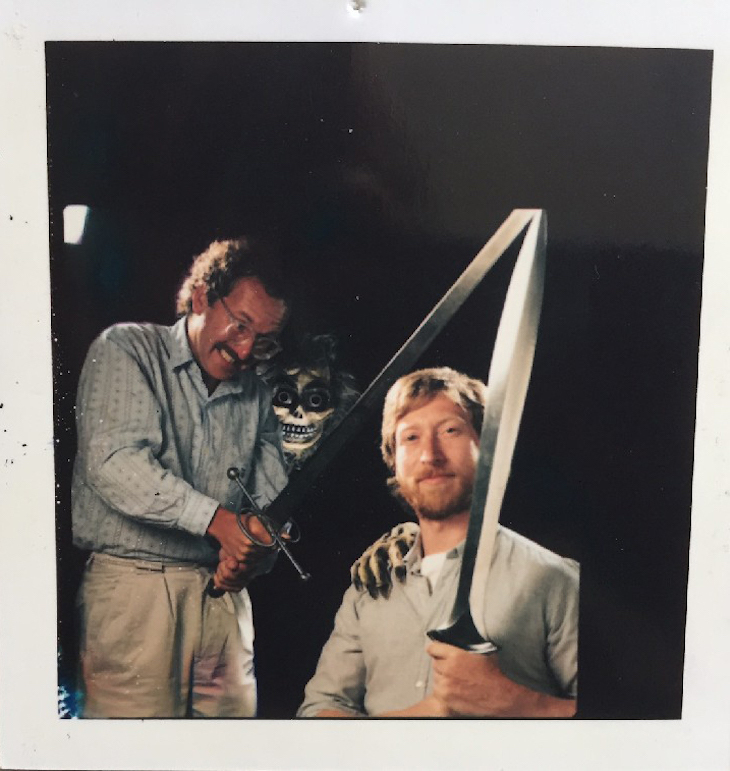 Living in a flat in west London in the early seventies, good friends Ian Livingstone and Steve Jackson would while away the long evenings with their favourite hobby; playing board games. It was particularly niche back then, but somehow the two managed to turn their hobby into a million pound business. 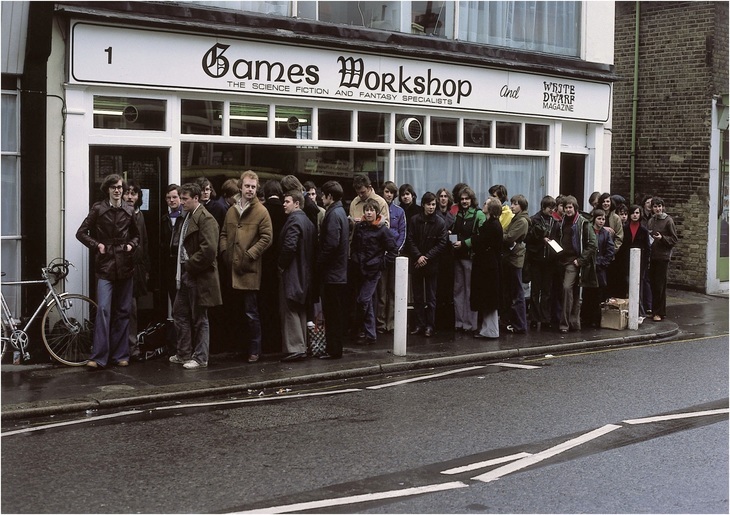 We caught up with the pair to chat about the genesis of the now-ubiquitous Games Workshop. In the evenings we'd go down the pub, have a few drinks with mates and then come back to one of our houses to play games into the wee hours. We played things like Subbuteo, some American war games, but it was really difficult to get hold of them. There was a game called Diplomacy, which was played quite a lot in the sixties. There was also postal Diplomacy, and there were lots of fanzines, where the games-master ran the games. You'd have to go to the trouble of negotiating either over the phone or by letter, with other countries you were at war with in the game. Then everyone would have to write to the games-master and he'd write back with the results of the moves. This would literally take months and months. I started a board game society at the University of Keele. I believe it was the first board game society ever in the UK, so we had nobody to challenge. As they got older and started to settle into their careers, Steve was heading down a path he was unhappy with: "I was going to be a nature warden. I did a three month job during a breeding season, and decided after that, there was no way I was going to be involved with this, because it was so lonely. When it was all over I came up to London and stayed with John and Ian and that's really where Games Workshop started." "We all met up in London, shared a flat and continued our hobby of playing games," Ian recalls. "We just started musing on how we could turn our passion of playing games into some sort of career. Let's find other people who are like-minded — so we decided to publish a magazine." "Well that's a liberal use of the word magazine — it was a four page fanzine called Owl and Weasel. 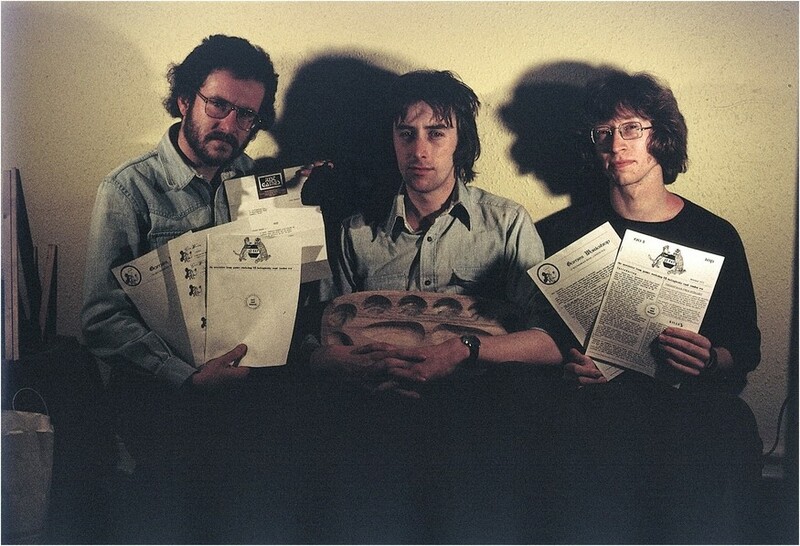 This is back in February 1975 and we sent it out to everyone we knew in games and the proposition was: we're games players, we want to try and form a community around that." Issue 6 of Owl and Weasel, the one that found its way to Gary Gygax. "We sent out Owl and Weasel free to everyone we knew, and one of the copies found its way to Gary Gygax in Lake Geneva, Wisconsin. He wrote to us and said: "I love your magazine, here's this game I've just invented.' Said game was Dungeons and Dragons." The group was naturally excited but also cautious, according to Steve. "We'd heard a lot about Dungeons and Dragons, it all seemed a bit strange, you couldn't get your head around it. 'What do you mean there's a game with no winner, no loser? It goes on for ever.' It was a difficult concept to get over, but it was such a brilliant game. Everywhere we went, we told people about it — 'it's going to be the future of gaming' — sure enough it was in the end." Ian says it didn't take long for the game to win them over "We played it and Steve and I were immediately obsessed. John was more of a traditional games player, he didn't like it... As soon as we got D&D, we knew we needed to pivot and put everything into fantasy." According to Steve, "John left because he wasn't really interested in fantasy games, he did wooden games." That's where the name Games Workshop came from; John made wooden backgammon boards that they'd try to sell to local retailers. Without John, the duo ploughed ahead with their eyes firmly focused on the fantasy market. 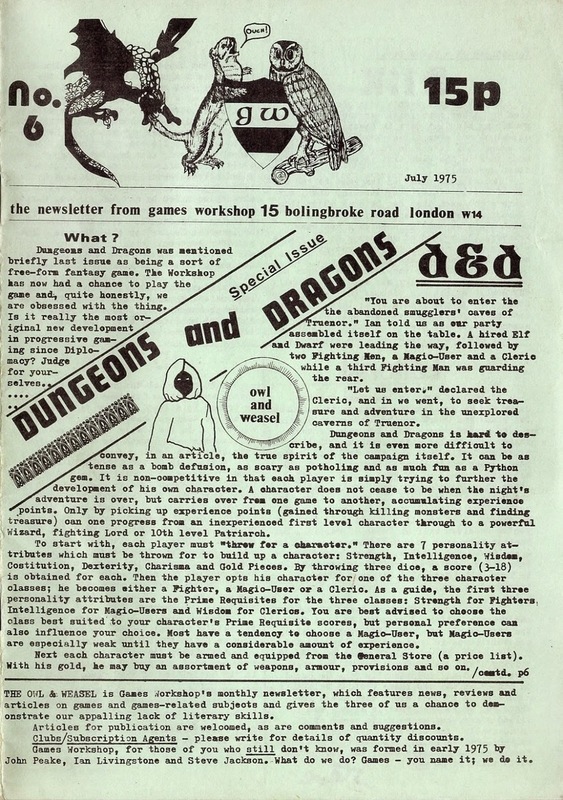 "We emptied our pockets and found enough money to order six copies of D&D, and on the back of that order we got an exclusive three year distribution deal for the whole of Europe." So they became a board games retailer based in their Shepherd's Bush flat, which had its difficulties as Ian points out. "It was on the top floor of the building. We started selling D&D by mail order, but people would be milling about outside looking for a shop. Of course it wasn't a shop. We'd have to open the window and yell down: 'are you looking for Games Workshop? Up here mate.'" "We didn't have a phone in our flat — and there were no mobile phones back then — so we shared a public payphone on the ground floor with our landlord. The phone would always ring, it would be telephone sales for D&D and we'd run down the stairs, and it'd be too late because he'd just hang up on people, because he got fed up of all the calls." "Ultimately we agreed we had to leave because people and parcels were arriving. 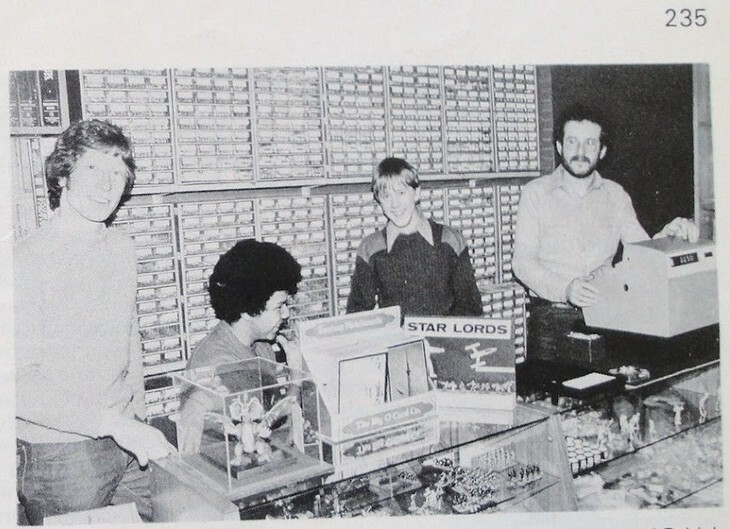 In August '76, Steve and I decided to go to Gencon in Lake Geneva to meet Gary Gygax and other fledgling games companies. We went over there and bought a loads of stuff, while the stock we had at the time was in my girlfriend's flat. When we got back, we had nowhere to live." They poured everything they had into the business. Steve recalls "we found a cubby hole round the back of an estate agents, it was £10 a week. We couldn't find a place to live, but that seemed less important than getting this business going." Ian's life settled into a slightly esoteric routine from the van. "Luckily there was a squash club nearby, so we'd deal with the mail orders past midnight, get into a stinky bed, then up in the morning for a shave and shower at the club. Got really good at squash by default." "The office was so small that if a customer arrived, one of us would have to leave as it wouldn't have space for all three of us." Sounds like a real life Mitchell and Webb sketch but Ian didn't mind. "It wasn't seen as hardship, we were young and living the dream, it was brilliant fun." Expansion was slow as people didn't really get what the duo were doing. "So we went to the bank, and met with a bank manager. We'd say, 'Hello! We've got this great game, it's a role-playing game, in which you're a hero or a wizard or a cleric, and you go on these fantastic journeys of the mind.' He looks at you rather like a dog watching television and urges you out of his door." They thought you were a sad individual who should get a proper job. How could you possibly think about making a career from something as trivial as a game? That still lingers in some people's minds today. Retailers also failed to see the appeal in these games, so the pair opened their first store on Dalling Road in Hammersmith in 1978. 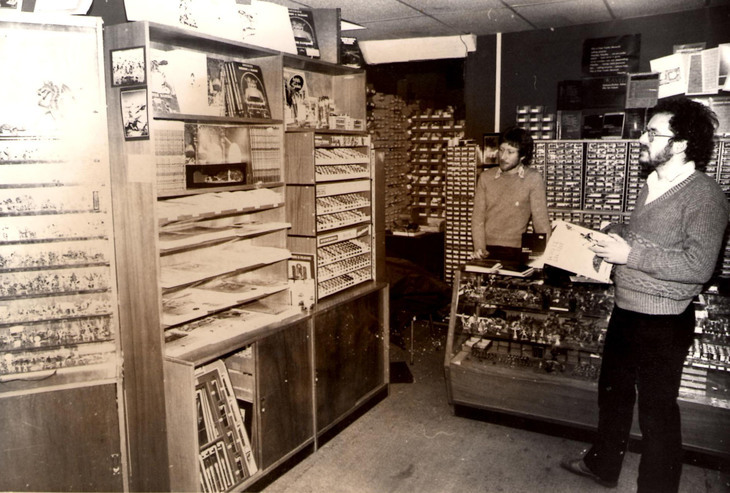 There are now hundreds of Games Workshop stores, but it all started there. We had no idea how big it would become. We didn't set out to make money, we just wanted to turn our hobby into a career. That's the ultimate dream, isn't it? When there's no difference between work and play. Today the board game business is booming, and in Ian's eyes, a lot of that's down to Kickstarter. "Crowdfunding has allowed for games to be made that would not ordinarily have been. When people used to self-publish games, they didn't have a distribution channel. So they'd make 5,000 copies, of which 4,900 would end up in their garage for life. With Kickstarter, the market gets to tell you whether or not your idea is any good." It's fitting then that the pair, and everyone else involved, are now doing some crowdfunding themselves. This time it's for a book, a history of the early years of Games Workshop, called Dice Men. It tells the story of how a couple of friends' hobby, conquered a country, with the company going on to open many more stores and even publish their own games. You can find details of how to pledge money to Dice Men over at Unbound.